Was Cornelius’s Household Saved by Baptism in Jesus’s Name? When Cornelius’s household was saved, some have concluded that they was saved when the Holy Spirit fell upon them while others believe that they were saved when they were saved by baptism in Jesus’ name, and still some believe that they were saved when they first believed before receiving the Spirit or baptism in water. Across Christendom, the salvation of Cornelius’ household is a vital discussion between the differing groups of believers from being saved by faith only to being saved via baptism in Jesus’ name to being saved by the baptism of Holy Spirit. Which is it? Some say that it doesn’t matter and that each person is saved by a different spiritual experience including these three. 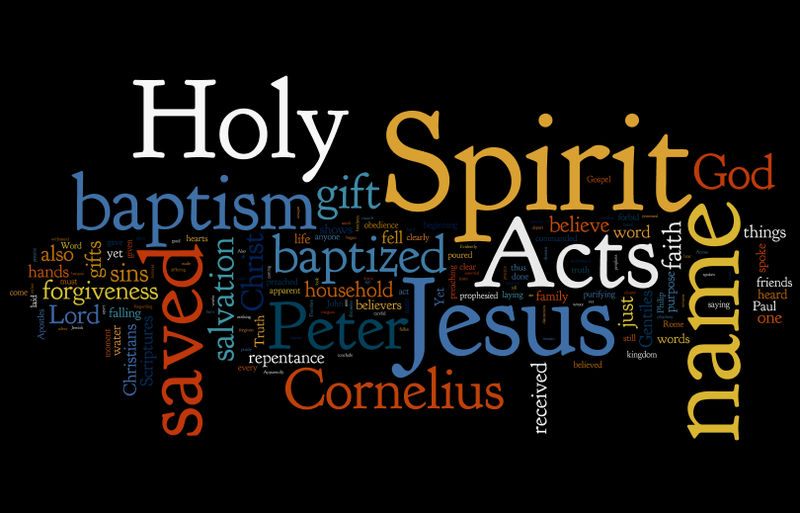 When the Spirit fell upon Cornelius’ household, Acts 11:15-16 says that this was the baptism of the Holy Spirit. The Holy Spirit falling on them as a part of the giving of “the gift of the Holy Spirit” (Acts 10:45). In Acts 2:38, the gift of the Holy Spirit was promised after repentance, baptism in Jesus’ name, and the forgiveness of sins. There is a clear disconnect between salvation and receiving the Spirit with His miraculous power in Acts 2:38. Acts 2:38 and other such passages like Titus 3:5-6 show that salvation was not by receiving “the Gift of the Holy Spirit”, but that the Gift followed salvation. This is not to say that the revelation from the Spirit through the Gift is not essential to salvation. The Gift was “poured out” (Acts 10:45) by which these Gentiles spoke in other languages (Acts 10:46). This is in Acts 2 when Peter spoke on how Joel 2 was fulfilled in that the Spirit was “poured out” on them. This is just as Peter revealed to other Jewish believers, “And as I began to speak, the Holy Spirit fell upon them, as upon us at the beginning” (Acts 11:15). Apparently, the miraculous portion of the gift of the Holy Spirit was only directly given to the Apostles in the beginning, and then only unto Cornelius’ family and friends for a specific and unique purpose. This is why God gave the Spirit and His power to the Gentiles to show that God is not partial. Therefore, Peter was right to conclude, “Can anyone forbid water, that these should not be baptized who have received the Holy Spirit just as we have?” (Acts 10:47). Why? One must be born of the water and the Spirit (John 3:5, Titus 3:5-6). Yet, it was not the gift of the Holy Spirit that saved them. It was not the miraculous gifts that saved the Christians in Rome, because the Christians there did not have any gift when Paul wrote them (Rom. 1:11), and yet they did have the Holy Spirit and they were saved (Rom. 8:9-11). These Christians had the Spirit within them. They were saved and did not have the miraculous gifts yet. As Christians at Rome were “freed from sin” (Rom. 6:7) and saved by the power of the Gospel (Rom. 1:16), so was Cornelius’ household saved without miraculous signs from the Spirit. Miraculous gifts does not save one’s soul. Jesus said, “I never knew you; depart from Me, you who practice lawlessness!” to those who claimed, “Lord, Lord, have we not prophesied in Your name, cast out demons in Your name, and done many wonders in Your name?” (Matt. 7:21-23). To make it even clearer that Cornelius was not saved by the baptism of the Spirit and its miraculous gifts. Acts 11:13-14 makes it clear that the it is by the words of Peter that they were to be saved. Then Acts 15:9 clarifies that Cornelius’ friends and family were saved “by faith“. Their faith was not from the miraculous out pouring of the Spirit, because they believed before receiving the Spirit (Acts 15:7-8). For it is the Truth, the word of God, that sanctifies (John 17:17). The Scriptures teach that one is born of again by the Word, the Truth (1 Peter 1:23). When were Cornelius’ household saved? Salvation for Cornelius was according to the Word of God spoken by Peter, who said, “To him all the prophets bear witness of the forgiveness of sins to be received through His name for everyone who believes in Him” (Acts 10:43, Verbal Translation). The forgiveness of sins was received through the name of Christ by those who believed. In Acts 10:47-48, there is mention of the salvation in Jesus’ name when Peter said, “‘Can anyone forbid water, that these should not be baptized who have received the Holy Spirit just as we have?’ And he commanded them to be baptized in the name of the Lord.” Here, baptism in Jesus’ name is commanded, which meant baptism in water just as Acts 2:38 says, “Then Peter said to them, ‘Repent, and let every one of you be baptized in the name of Jesus Christ for the forgiveness of sins; and you shall receive the gift of the Holy Spirit. '” Here was the forgiveness of sins by baptism in Jesus’ name. In Acts 2 and Acts 10, salvation and forgiveness is through Jesus’ name, but the receiving of the miraculous power of Spirit came at different times. These were baptized again into the baptism in Jesus’ name, and then “And when Paul had laid hands on them, the Holy Spirit came upon them, and they spoke with tongues and prophesied” (Acts 19:6). The gifts of the Spirit as the miraculous portion of the Gift of the Holy Spirit are clearly separated from baptism in Jesus’ name. Baptism in Jesus’ name is when one is forgiven, and as Acts 2:41 and 47 show that by baptism in Jesus’ name, these were saved and thus added to the Church. No, for John 7:39 teaches that wouldn’t happen until Christ was glorified and the Apostles were saved before that time. From the beginning of the NT church (Acts 2:4) and on when the Spirit is received Christ indwells in us as well as His word. Don’t you have a specific article dealing with Acts 2:38? You often appeal to it elsewhere but I haven’t seen any article specifically about this passage.